German security authorities have arrested 3 Al Qaeda Jihadists of Moroccan origin who they say were planning to conduct terrorist attacks in Germany. This report comes at the same time that Al Qaeda has renewed attacks in Morocco with a bomb attack at a cafe which killed 16 people. Germany has thwarted Jihadist terrorist plots several times in the past few years, including a plot to bomb trains and train stations which came very close to fruition. German authorities have also closed mosques which have been tied to Jihad and Jihad recruitment. In this latest incident, three men were arrested in the cities of Dusseldorf and Bochum, after having been under surveillance since November. According to German police, the 3 terrorists were planning attacks involving explosives. Though it is not known if Dusseldorf was the target, the city is scheduled to host a large music festival on May 14th. No doubt, more details will become available when these men appear in court in the days and weeks to come. We thought we’d post this article for those naive individuals out there who still believe that America’s porous borders are not a national security issue. Anyone who isn’t concerned when a known Jihadi is involved in human smuggling along our southern border just isn’t paying attention. A federal judge sentenced a Somali man to 10 years in prison for failing to acknowledge ties to two global terrorist groups after he was arrested near the Texas-Mexico border in 2008. Ahmed Muhammed Dhakane, 25, prompted the Department of Homeland Security to issue an alert in May 2010 asking Houston-area authorities to be on the lookout for a suspected member of al-Shabaabp, an al-Qaida ally based in Somalia. That warning came when two new charges of lying on a U.S. asylum application were filed against Dhakane, who had been arrested on immigration charges in Brownsville, across the Rio Grande from Matamoros, Mexico, in March 2008. Dhakane pleaded guilty on Nov. 2 to two counts of lying on his asylum application, and the Justice Department said in a statement that he failed to acknowledge he had been a member of, or associated with, al-Barakat and Al-Ittihad Al-Islami, from prior to Sept. 11, 2001, until January 2003. Al-Barakat is a financial transfer network; Al-Ittihad al-Islami, or the Islamic Union, wants to impose Islamic law in Somalia. Both are on the U.S. Treasury Department’s list of global terrorist groups with links to al-Qaida, according to the indictment against Dhakane. U.S. District Judge Xavier Rodriguez in San Antonio sentenced Dhakane to 10 years behind bars, and ordered that he be placed under supervised release for three years after completing his prison term. Dhakane also lied about his traveling partner, a minor he claimed was his wife. The Justice Department said she was actually a smuggling client, that the pair were never married, and that Dhakane repeatedly raped and eventually impregnated her prior to traveling to the U.S. He also threatened to have her killed if she told authorities he had raped her, and that they were never married, according to the statement. Citing a Justice Department memo and other documents it obtained, the San Antonio News-Express reported in March that federal officials believed Dhakane helped “violent jihadists” from East Africa sneak through Mexico and into Texas. Ron Paul is at it again. But let’s not get to worked up about the crazy old loon. After all, he’ll be 76 in August. That will make him 77 by the time the next president is inaugurated. That’s nearly the age President Reagan was when he left office after two terms. Ron Paul isn’t in this race to win. He’s one of those perpetual candidates for president who just adores the attention. In his latest appearance on Fox News, Paul manages to stick to his McGovern-like “Blame America First” script with the tired old assumption that Jihad is being waged against us just because we are in Saudi Arabia, or Iraq, or Afghanistan, or especially because we are an ally of Israel. Paul appears to be a disciple of Michael Schuerer, who has been spouting that line since BEFORE he left the CIA. It is interesting that Ron Paul bases his entire philosophy on the global Islamic insurgency on the opinions of Michael Sheuer. Michael Sheuer epitomizes all that is wrong with America’s bureaucratized counterterrorism apparatus. First of all, he broke longstanding CIA regulations at the encouragement of his politicized superiors to write a book while in active service. This alone makes him a scumbag in my book. Thousands of honorable CIA operators could have done the same, but none did. There is a reason. It’s called honor. Second, Sheuer had a uniquely disturbing career in the CIA. A career analyst with no field experience, he was somehow allowed to become a case officer and eventually found himself in charge of the CIA unit tasked with killing or capturing Bin Laden. He failed miserably. Moreover, if you actually read his work, it is readily apparent that Sheuer has at best a superficial level of knowledge of Islamic threat doctrine. He is appallingly ignorant for someone who was in the position he was in. This has resulted in his belief that we are only being attacked because of things we have done and especially for our support for Israel. Is Jemmaah Islamiya attempting to establish an Islamic state in Indonesia because the US supports Israel? Are the Chechyan jihadists waging Jihad against Russia because the US supports Israel? Is Abu Sayyef attempting to establish an Islamic state on Mindanao because the US supports Israel? Are Jihadists attempting to establish an Islamic state in southern Thailand because the US supports Israel? Have Nigerian Jihadists attacked innocent Christians repeatedly because the US supports Israel? Is Al Shabaad conducting terrorist attacks in Kenya and Somalia on innocent civilians because the US supports Israel? Are Jihadists attempting to create an Islamic state in India’s Kashmir because the US supports Israel? Have Jihadists killed thousands in attacks on innocent civilians in Morocco, Algeria, Argentina, Brazil, the UK, Spain, Jordan and Bangladesh because the US supports Israel? Are young Jihadis rioting in France because the US supports Israel? Why is all this happening? Could it be that there is something more to this global violence than the simple “blame America first” concept that Ron Paul supposes? Why hasn’t he bothered to learn about the enemy threat doctrine? You will see this document written up in dozens of articles in the media and the blogosphere over the next few days. We wanted to call attention to one list that has come out of that report: a list of foreign mosques and Islamic centers that are used to recruit and train Jihadis. Note that this list does not include mosques here in the US which, beyond a shadow of a doubt, are also centers for Jihad recruitment. This list is not meant to be exhaustive, but it does purport to be the largest centers of Jihadi activity. Terrorist organizations affiliated with Al Qaeda are advising Libyan insurgents to stockpile weapons in preparation for the post-Gaddafi phase, saying the war in Libya is expected to continue even after the fall of the current regime. Six terrorist groups affiliated with Al Qaeda called on insurgents who want to create an Islamic emirate in Libya to take steps and be ready for after Gaddafi, adding that the next enemy will be the pro-Western Libyan opposition. Libyans have long played a prominent role in Al Qaeda. The Libyan Islamic Fighting Group (LIFG) trained in Afghanistan during the Taliban regime and supported the Taliban in a number of ways during the 1990s, in return for the Taliban granting them safe haven. Some claim that a Libyan named Abu Yahya al-Libi will be the successor to Osama Bin Laden to lead Al Qaeda. Yahya Al-Libi actually was captured in Afghanistan but escaped from US custody at Baghram air base in July 2005. Another prominent Libyan who has been involved with Al Qaeda and the Taliban is Abu Laith al-Libi. This terrorist was arrested in Saudi Arabia in the crackdown following the Khobar Towers bombing in 1995, but, like so many Jihadis, he managed to escape from prison and ended up in Afghanistan, where he became a spokesman for Taliban leader Mullah Omar. Finally, a Libyan named Atiyah Abd al-Rahman was also a member of LIFG and was imprisoned in Algeria in the 1990s. By 2000, either by escape or being set free, al-Rahman ended up in Afghanistan and became a part of Al Qaeda’s leadership cadre. He reportedly remains near the top of Al Qaeda today and is said to handle the organization’s liason with global Jihadist organizations and Iran. A classified document used by military and intelligence officials in the determination of a Guantanamo detainee’s linkages to al Qaeda and associated movements lists the intelligence services of Pakistan, Iran, and Yemen as “associated forces” known to support al Qaeda and allied movements, including the Taliban. The document, titled “Matrix of Threat Indicators for Enemy Combatants,” was one of more than 700 documents released to select news agencies by WikiLeaks. Nearly 500 Taliban, including commanders, escaped recently from prison in Afghanistan. You can bet that this was an inside job. 5 prisoners escaping can be chalked up to incompetence. Not 500. 500 is certainly collusion. 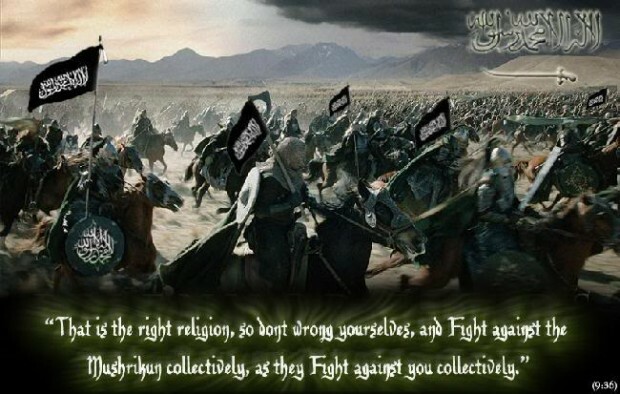 This is a scenario that has been oft-repeated throughout the Islamic world, though not involving such large numbers. Jihadis have made their escape in Saudi Arabia, Iraq, Yemen, Algeria, Egypt, Pakistan and Indonesia over the years, almost certainly with the aid of those who were supposed to be guarding them. A Saudi national said to be the North Caucasus point man of Al Qaeda and the brain behind spate of suicide attacks in Russia was killed by security forces in the country’s restive province of Chechnya, officials said. The militant only known by his nom-de-guerre of Moganned who had been eluding Russian forces for over three years was killed along with two other militants in a shootout in the village of Serzhen-Yurt in Shali district of Chechnya, during a search operation, Russia’s anti-terrorism agency announced. Along with Chechen militant leader Doku Umrav, Moganned was the most wanted terrorist in the region. “One of the militants eliminated has been identified as the main emissary of International Terrorist Organisation, Al Qaeda in the northern Caucasus, a citizen of Saudi Arabia by the name of Moganned”, the agency said. “Almost all acts of terror using suicide bombers in the last few years were prepared with the involvement of the Saudi national”, it said. Russia has been rocked by an airport bombing that killed 37 in January this year and twin suicide metro bombings last year which killed more than 40 people. Patrick Poole: Did Obama and Holder Scuttle Terror Finance Prosecutions?